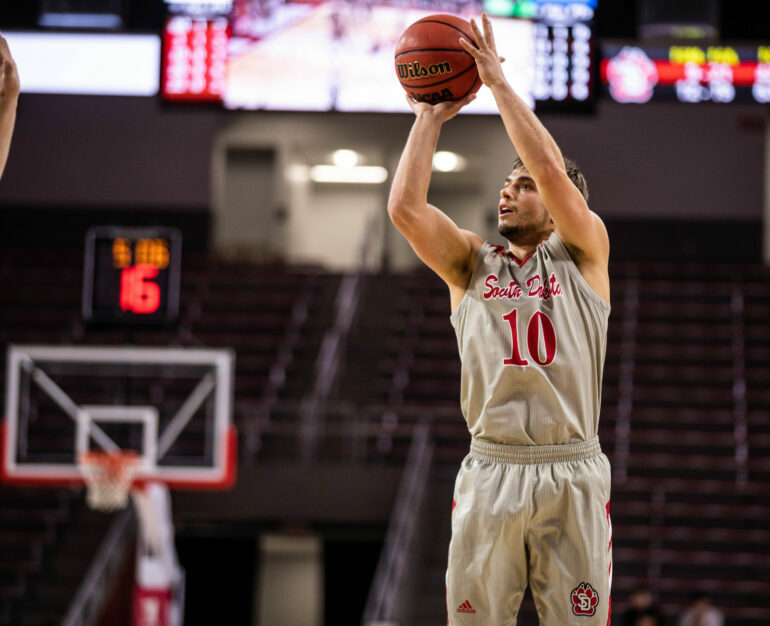 The USD men’s basketball team dropped a narrow game to Omaha 68-75 at Baxter Arena Sunday night. Sophomore Stanley Umude led the Coyotes with 20 points on 8-for-15 shooting. Junior Tristan Simpson, who leads the Summit League in minutes played, scored 17 on 5-for-13 shooting, adding three assists and three steals. In the last three games, Simpson has only sat out a combined three minutes. Junior Tyler Peterson tallied 12 points on 5-for-8 shooting. Omaha senior Zach Jackson led all scorers with 21 points on 7-for-12 shooting. Sophomore Matt Pile dominated both sides of the floor, posting a double-double with 12 points, 14 rebounds, three assists and four blocks. Jackson hit four of his final five three-point attempts to provide the Mavericks (11-8, 5-1) their seventh win in eight games. USD and Omaha mirrored each other in the first half, both teams recording 18 rebounds, six turnovers and a 37.9 shooting percentage. Seven of Umude’s 13 first-half points came in the final three minutes, capped by an and-one layup to put the Coyotes up 30-27 at halftime. Matt Pile and Mitch Hahn took advantage of USD’s lack of size, as Omaha outrebounded the Coyotes 34-22. Omaha also shot 65.4 percent from the field in the second half. Omaha is now tied with South Dakota State (5-1) for first place in the Summit League. USD retains fifth place with just over a month of conference play remaining. USD rounds out their three-game road trip against North Dakota in Grand Forks, N.D. on Wednesday at 7 p.m.